I love the color contrast in this bright 20 x 63" scarf. The background is fairly equal in its use of white. black and shades of grey. The punch of color comes from what look like paint brush strokes in beautiful, sun-shiny yellow. This corded necklace is made using waxed cording and a cording made of nylon and spandex (looks very much like suede). The length can vary from about 17 to 20 inches with a center jeweled piece that adds 4 inches. It is done in a black, grey and yellow. 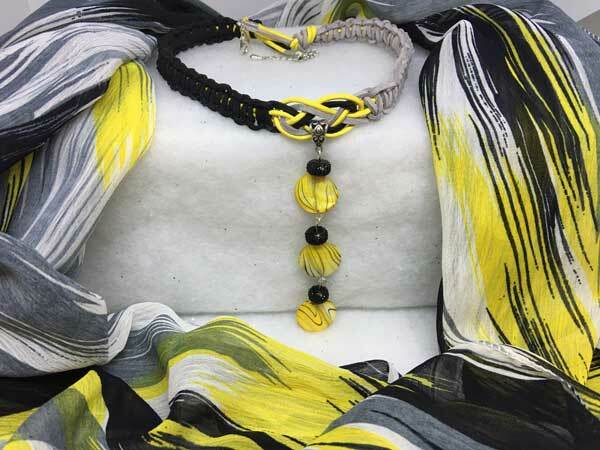 The jeweled piece is made with beautifully coordinated glass coin beads with a light grey background, varied yellow running through, and black swirls throughout. I initially made this piece using one long head pin, but decided to separate each coin bead for extra movement and sparkle, with less chance of damage to such a lengthy piece. Each coin bead is topped with a sparkling black rondelle. The piece is finished with a lobster claw clasp and added chain for more versatility with the length.